I love indian food! And in Singapore there are plenty of authentic restaurants everywhere, serving all kinds of indian dishes. Which was great as my attempts to cook indian myself, weren’t too successful.. it never tasted quite right and I was honestly a bit overwhelmed with all those spices and had no clue on how to use them properly..
Until I found a cooking class held by lovely Payal, who introduced me to the fascinating world of indian spices and the mysterious but beautiful spice box (see pictures at the bottom of the post). 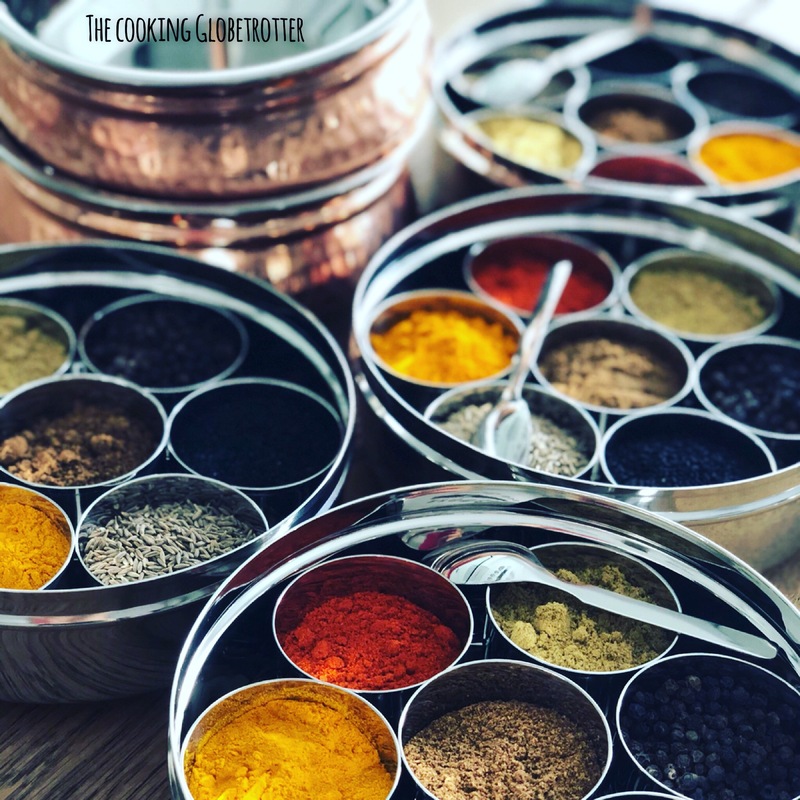 I purchased Payal’s cook book “Curries for the soul” where she explains step by step how to make a variety of indian (and some thai) popular dishes and wanted to cook all the recipes straight away! I needed to gear up on the basics first, so after a trip to THE indian department store in Singapore (yes, of course I’m talking about Mustafa, my Singapore-based friends!) where I stocked up on spices, spice box and the typical copper bowls, I was ready to give it a go myself! And the result was pretty good, look!! 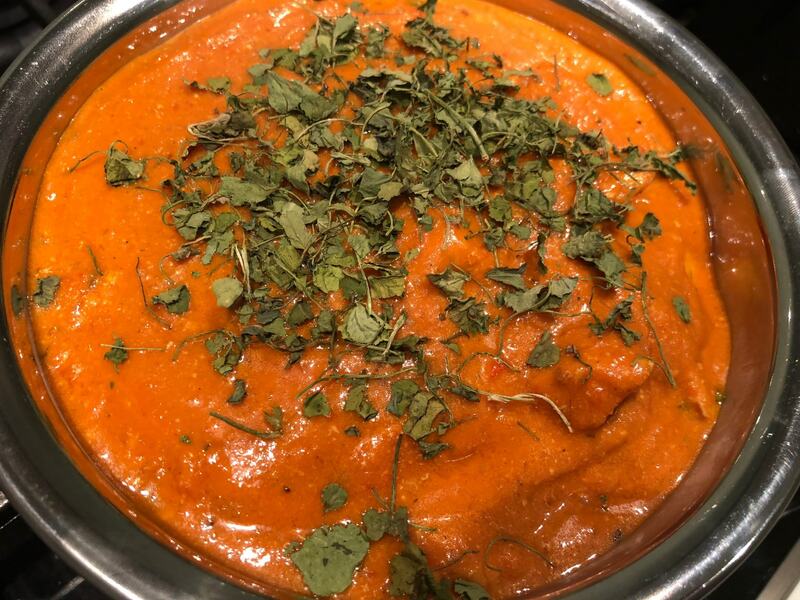 I cooked this delicious Chicken Tikka Masala, adapting Payal’s recipe slightly to our own taste. Served with steamed rice and/or Naan (indian flat bread) it makes a delicious meal. 2. prepare the sauce and add the chicken and finishing touches. Clean the chicken meat (breast or thighs, as you prefer) from fat, skin and bones. Cut it into squares (2×2 cm more or less). Place it in a bowl. Add 2 TBSP of plain yogurt, 1 chopped garlic clove, 1 cm of chopped ginger, 1/2 tsp of turmeric powder, 1 tsp of salt, 3/4 tsp of garam masala, 3 cardamoms smashed in a morsel (or just as good as you can with a pan or meat tenderizer), 1/4 tsp of chili powder and the chopped chili (whole for very spicy, half for mild, omit if you don’t want it hot). Mix well, cover and let marinate in the fridge for 3-4 hours. The best thing would be to grill the chicken on the barbecue, if you are able to do so, you will want to put the pieces of meat on some (im water soaked) skewers first, as it will make your life much easier! If you don’t have a bbq or are looking for an easier fix, use a grill skillet or a normal non sticking frying pan. Cook the chicken until just through, 6-8 minutes. Set aside. Put your saucepan (a normal one, not a non sticking, as we want to use the hand blender in it) on the stove and turn the heat to high, pour 2 tablespoons of coconut oil (or extra virgin olive oil) and heat, pour the cumin seeds (1 tsp) in it and let them heat for a moment, then add the onions (1 roughly chopped), red pepper (1 roughly chopped), ginger (1 cm finely chopped), garlic (1 clove finely chopped), chopped fresh chili (1 whole for good heat, 1/2 for mild, omit if you don’t like it spicy) and let it cook until the onion is slightly golden brown. Add water if you need to. Add tomatoes (1 can of pureed tomato or tomato sauce) and mix well. Take away from the heat and blend with a hand mixer (be careful, it may splash around and it’s hot!). You can otherwise leave the sauce like this, if you prefer. Put on the fire again, add turmeric powder (1/2 tsp), chili powder (1/4 tsp), coriander powder (1 tsp) and salt (1 tsp) and mix well. Add the grilled chicken to the sauce, mix well and bring to a boil. Cook for about 10 minutes, if the sauce reduces too much, add water, stir well and bring again to boil. Cook for 10 minutes on low heat and covered with a lid. Add garam masala (1 tsp), coconut milk (or cream, 100 ml) and kasuri methi leaves (2 TBSP) and stir well. If you can’t find the Kasuri Methi (dried fenugreek leaves), add fresh coriander or parsley, finely chopped. Serve with steamed white rice and/or naan bread. Look how gorgeous this spice boxes are!! I prepared 5 of them (for me and 4 friends), my house smelled like an indian bazar for days!! Thanks to Payal Thakurani for introducing me to the indian kitchen. You can find more about her on Facebook under “Curries for the Soul”.